Some services, such as Outlook Anywhere, Cutover migration to Office 365, and Exchange ActiveSync, require certificates to be configured on your Exchange 2010 server. This article shows you how to configure an SSL certificate from a third-party certificate authority (CA). 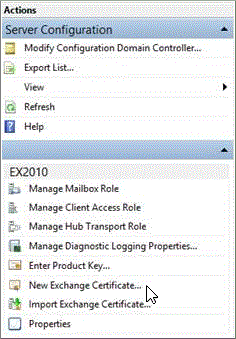 In order to add certificates, you need to be assigned the Organization Management role group on the Exchange 2010. Adding an SSL certificate to Exchange 2010 is a three step process. Select the server to which you want to add the certificate. 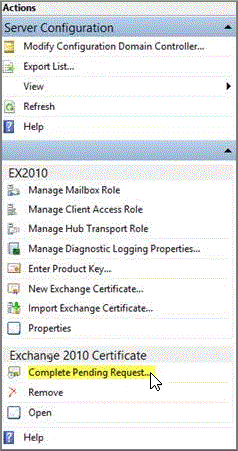 In the Actions pane, choose New Exchange Certificate. 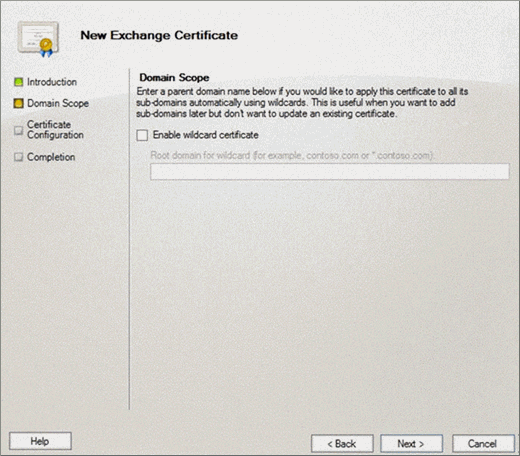 In the New Exchange certificate wizard, specify a name for this certificate, and then choose Next. In the Domain Scope page, specify the root domain for all subdomains in the Root domain field. If you want to request a wildcard, select Enable wildcard certificate. If you don't want to request a wildcard certificate, you will specify each domain you want to add to the certificate on the next page. Choose Next. On the Certificate Domains page, add any additional domains you want included on the SSL certificate. On the Organization and Location page, provide information about your organization. This information will be included with the SSL certificate. Specify the network location where you want this certificate request to be saved. Choose Next. On the Certificate Configuration page, review the summary information, choose New to create the certificate, and then choose Finish on the Completion page. Select the server to which you want to import the certificate. In the Exchange Certificates pane, select the request you created earlier, and in the Actions pane, choose Complete Pending Request. On the Complete Pending Request page, specify the path to the SSL certificate file you received from your CA > Complete. On the Completion page, choose Finish. To assign services to this certificate, on the EMC, select the Exchange server, and then select the certificate in the Exchange Certificates tab. In the Actions pane, choose Assign Services to Certificate. On the Select Servers page of the Assign Services to Certificate wizard, select the name of the server to which you're adding the certificate > Next. On the Select Services page, select the services you want to assign to this certificate. At a minimum, you should select SMTP and IIS. Choose Next. On the Assign Services page, choose Assign. If you receive the warning Overwrite the existing default SMTP certificate?, choose Yes > Finish.